For your minor to intermediate home improvement needs, talk to the technicians at Sears Handyman Services for help. Our employees are experienced in many home repair tasks, such as building decks and handling plumbing issues. It can be frustrating and time-consuming to complete repairs and renovations, and that's where our services come in. Home maintenance is crucial, and your home requires care and attention all through the year. For all the items on your to-do list, call Sears Handyman Services for help. Give us a call at (937) 736-2445. At Sears Handyman Services, we are equipped to handle all minor electrical and lighting installations and repairs that don't require a professional electrician. We can install LED, recessed lighting, and other light fixtures. We can also help with the replacement and repairs of ceiling fans and more. It may be a little difficult for a homeowner to accomplish these tasks on their own. So call today for help with these and other electrical issues. The following list is just an example of some of the tasks Sears Handyman Services can perform. We can also mount flat screen televisions, assemble furniture, and lay flooring. Save valuable time and money and give our qualified technicians a call. Our Sears handyman experts know how to patch, hang, and tape drywall. For minor or major repairs, you can trust our trained handyman technicians. Most homes today have drywall, which is frequently used in construction. It's sturdy but likely to break if struck by hard objects. In addition, putting nails in drywall can leave unsightly holes behind, but that's an easy fix for Sears Handyman Services. Deck staining, water damage prevention, and wood rot repairs are a few of the many tasks our technicians can perform. We can even build a brand new deck. Sears Handyman Services understands that deck maintenance requires a lot of attention, and our technicians are always available to assist with all your deck maintenance and repair needs, so you can get back to enjoying barbecues and relaxation. For great economic value, a chain link fence is a perfect choice. A Sears handyman technician can install one for you, as well as a picket or privacy fence. Improve your home's appearance while simultaneously gaining privacy, marking your property line, and enclosing your yard. 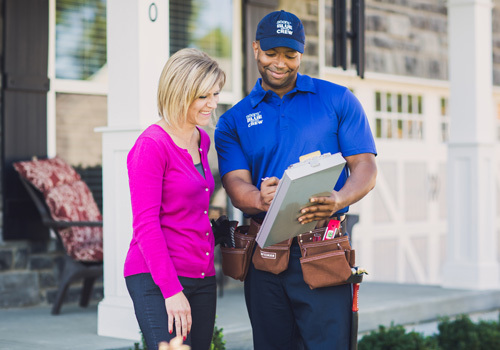 Ask our handyman technicians to help determine the right choice for your needs. To rejuvenate the look of your home, inside and out, try giving it a fresh coat of paint. Painting is often a taxing and time-consuming chore. Many homeowners find it difficult to climb ladders, use rollers to reach high ceilings and walls, and remove wallpaper. If you need help with these tasks and more, contact Sears Handyman Services. They will help you get your home looking fresh and revitalized in no time at all.